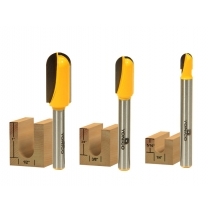 Round nose bits are perfect for routing channels in cutting boards and counter tops and to produce flutes in solid wood. They can be used in a CNC machine to route simple paths but should not replace the ball nose spiral bits for versatility and finish. Yonico Round Nose router bits feature micro-grain C3 carbide blades, anti kick-back design and solid hardened steel bodies. The bearings used on these bits are fully enclosed high quality lubricated ball bearings. These bits also carry a limited lifetime warranty and satisfaction guarantee.